Second-generation variant of the Super Record rear derailer, w/revised pulley cage design. Parallelogram swings farther forward then on previous generation. Model identification numbers were changed in 1982 to the longer 7 digit number. 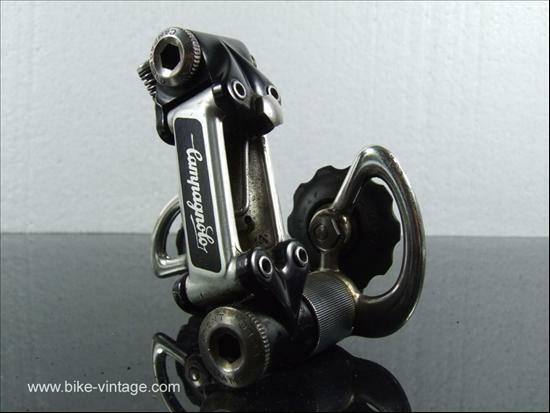 Version 1 of this derailleur included the bolt-on body spring which was later revised into a non-removable spring design attached to one of the pivot points. Rear plate marked with unique "Superecord" lettering until 1981/2. Final variants from 1985-1987 do not have replaceable parallelogram springs. This variant has its own entry. Variants with either gloss and black finishes exist (along with at least one known example with each end of different lusters). A comparison photo (of final-generation 1985-1987 RD's) is shown.